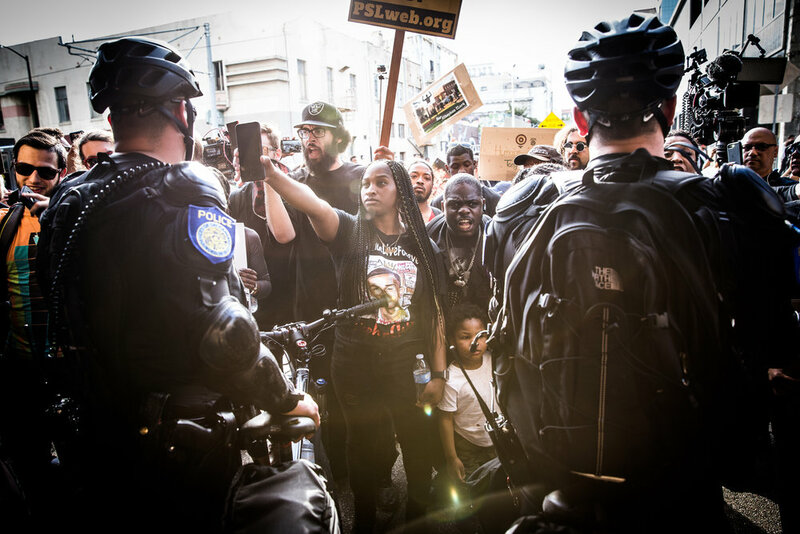 In the ensuing weeks and months, Sacramentans took to the streets to peacefully demand changes in policing and to hold the officers accountable. They took over city council meetings, blocked entrance to NBA games and rush hour traffic in downtown. In response, nearly a year later, Sacramento District Attorney Anne Marie Schubert announced that she would not file charges against the two officers and they remain on the job. Sacramentans continue to protest. Black Lives Matter protestors confront police in downtown Sacramento on March 29, 2018. Stephon Clark was shot and killed by two Sacramento police officers in his grandmother’s backyard while they investigated a vandalism complaint. 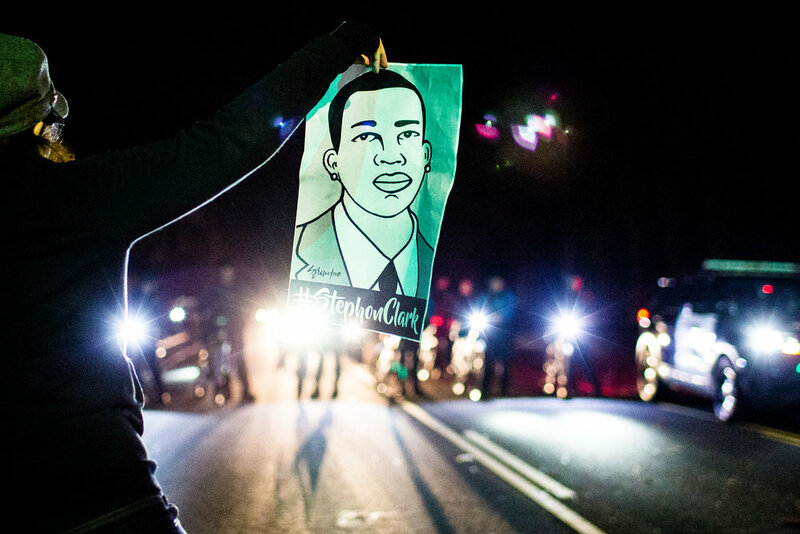 Since his death, Sacramentans have protested against local enforcement. Protestors march through a wealthy East Sacramento neighborhood known as the "Fab Forties" to protest the Sacramento County District Attorney's decision to not charge the officers who shot an unarmed Clark in 2018. Sacramento Police ended the evening by arresting 84 peaceful protestors. Stephon Clark’s brother, Stevante Clark, angrily jumps onto the desk of Sacramento Mayor Darrell Steinberg during a city council meeting calling for public comment on the police shooting of Clark. Stevante and hundreds of protestors briefly took over both the meeting and City Hall itself. Protestors take over City Hall during a city council meeting on the police shooting of Stephon Clark. Protestors face off against disgruntled NBA fans as they block entrance to a Sacramento Kings NBA game at Golden 1 Center while protesting the police shooting of Stephon Clark. Stevante Clark, Stephon Clark's brother, expresses his grief and frustration at a Black Lives Matter protest outside the Sacramento District Attorney's office on March 28, 2018. Nearly a later, DA Anne Marie Schubert would refuse to charge the two officers for the shooting of the unarmed Clark, and they remain on duty. California Highway Patrol Officers block Black Lives Matter protestors from marching onto Interstate 5 on March 30, 2018. Law enforcement face off against Black Lives Matter protestors in downtown Sacramento on MArch 30, 2018. Black Lives Matter activists and community members protest at City Hall in downtown Sacramento on March 30, 2018. A motorist is surrounded by protestors after trying to drive through a Black Lives Matter protest in downtown Sacramento. Protestors routinely blocked and disrupted traffic to draw attention to their demands. A protestor carries a vandalized campaign sign for the Sacramento County's DA office during a Black Lives Matter protest against the police shooting of Stephon Clark on the 50th anniversary of the assassination of Martin Luther King, Jr.
Police advance on peaceful protestors in the wealthy East Sacramento neighborhood known as the "Fab Forties" to protest the Sacramento County District Attorney's decision to not charge the officers who shot an unarmed Clark in 2018. Sacramento Police ended the evening by arresting 84 peaceful protestors. 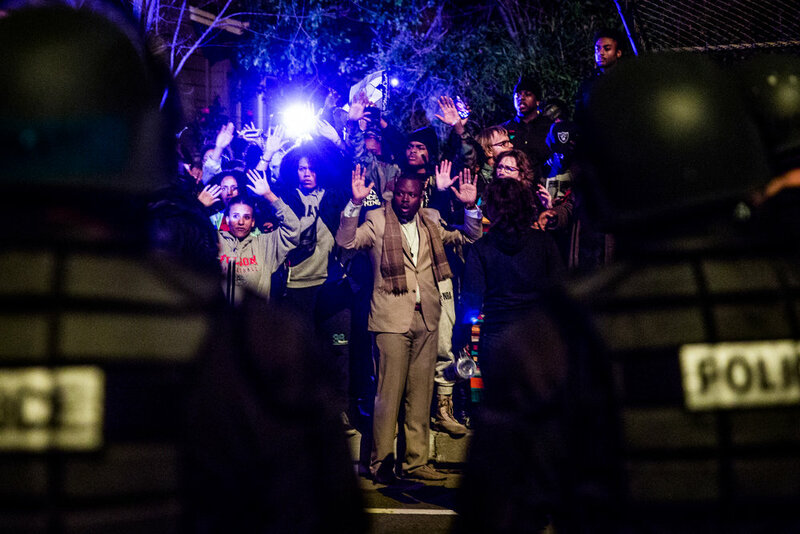 Tyvonne Joseph protests in the street during a candlelight vigil for Stephon Clark in South Sacramento on March 31, 2018. 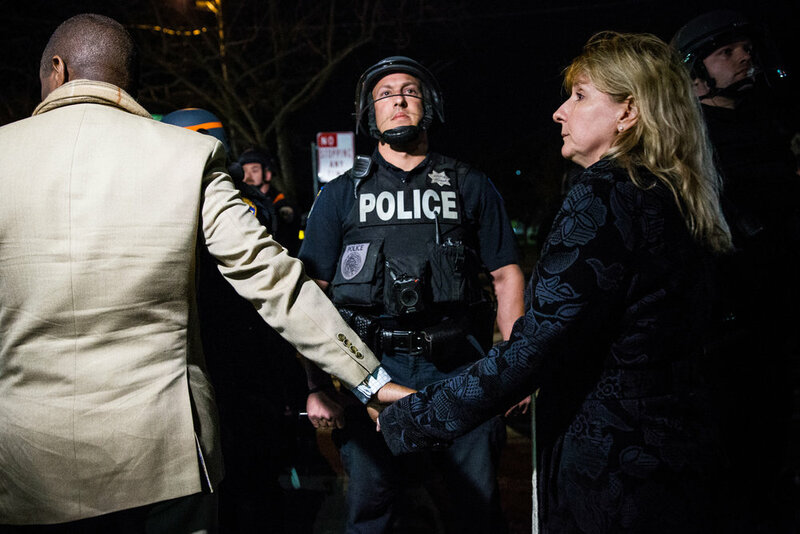 Clergy hold hands as police advance on protestors during a march through an East Sacramento neighborhood known as the "Fab Forties" to protest the Sacramento County District Attorney's decision to not charge the Sacramento Police Department officers who shot an unarmed Stephon Clark in 2018. Sacramento Police ended the evening by arresting 84 peaceful protestors, including clergy. Police “kettle” peaceful protestors in East Sacramento, arresting 84, including two journalists and several clergy. Later, all were released without charges. On the evening of March 18, 2018, Sacramento Police Officers Terrence Mercadal and Jared Robinet were investigating routine vandalism complaints in the Meadowview neighborhood when they shot and killed Stephon Clark, 22, in his grandmother’s backyard. They claimed he pointed a gun at them. It was a cellphone. In the ensuing weeks and months, Sacramentans took to the streets to peacefully demand changes in policing and to hold the officers accountable. They took over city council meetings, blocked entrance to NBA games and disrupted rush hour traffic in downtown. In response, nearly a year later, Sacramento District Attorney Anne Marie Schubert announced that she would not file charges against the two officers and they remain on the job. Sacramentans continue to protest.